Two hours before roasting, remove the lamb from the refrigerator. Place it in a large roasting pan. Mince 4 cloves of garlic. Add 1/2 teaspoon of salt to the garlic and mash it with the blade of a chef's knife until it is a paste. Put the garlic paste in a small bowl. Add the chopped anchovy, rosemary, pepper, mustard, and olive oil. Mix together with a rubber spatula. Using the spatula evenly coat the meat with the anchovy, mustard, garlic, and rosemary paste. Cover the lamb with plastic wrap and place it in a roasting pan fitted with a wire rack. Marinate the lamb for 2 hours or overnight in the refrigerator. Remove the plastic wrap from the lamb, place the pan in the oven and cook for 12 minutes per pound, or until the internal temperature is 125 to 130 degrees for medium rare. Remove from the oven and allow the meat to rest for 20 minutes. This allows the juices to relax back into the meat and ensures a juicy roast. Pour off the excess fat from the roasting pan. Place the pan on the stove over a low flame. Add the wine and veal stock. Let it come to a boil. Using a wooden spoon so as not to scrape up any metal, stir the pan to loosen the browned bits on the bottom of the pan. Transfer to a small saucepan and bring to a boil. Lower the heat to medium and reduce the sauce to 3/4 cup. Add salt and pepper to taste, using a rosemary branch to whisk in the butter. Reserve. 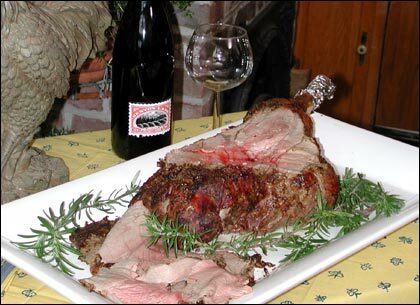 Carve the leg of lamb across the grain into thin slices. The outside pieces will be on the medium-well side and the inner pieces will be a perfect rare to medium rare. Serve with a spring salad. This segment appears in show #2711.